Designed by Scion Living to be stylish and practical in the modern home, this Mr Fox tea for one set comprises of a mug and an individual-sized teapot that fits snugly on top. It is crafted from top quality porcelain and is both microwave and dishwasher safe. You’d never believe that Mr Fox was once just a little sketch in the Scion designer’s studio in Leicestershire… now he is a household name in homes across the world. Mr Fox first appeared on bestselling fabrics and wallpapers before he made his way onto the Scion Living ceramics and homeware in 2012. 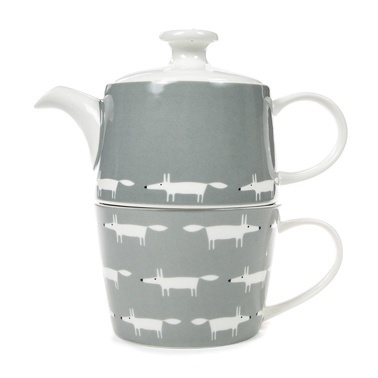 This Mr Fox tea for one set shows the iconic Mr Fox motif in white on a grey background. Designed collaboratively by skilled ceramicist, Keith Brymer Jones, and the Scion designers – using Keith’s knowledge of ceramic shape and the Scion designer’s expertise of contemporary design.